Belle Isle is a 398 ha (982 acre) island park located in the Detroit River. Native Americans called the island "Mah-nah-be-zee" or Swan Island; the French settlers called it "Isle St. Claire". During the 18th century, the island was used by farmers as a safe haven for their animals, thus the name, Hog Island. The island was renamed Belle Isle, which translates to "beautiful island." By 1845 it was a popular picnic spot for city residents. The City of Detroit purchased Belle Isle for $200,000 (U.S.) in 1879 and designated it as a park in 1881. The original park, designed by Frederick L. Olmsted, featured only recreational canals; however, in the early 1900s, the City built Lake Takoma, Lake Okonoka and some other canals. Historically, walkways along the water, ornate bridges and covered bandstands were popular attractions. Canoeing was an important recreational activity for island visitors. In the 1930s the Civilian Work Authority (CWA) labored with shovels, wheel barrows and small tractors to create more canals and lakes on the island. Belle Isle supports 3.5 km (2.2 mi) of canals and four lakes ranging from 7-17 ha (18- 43 acres). Unfortunately, 15 years of neglect had resulted in stagnant water, excessive aquatic weed growth, and poor aesthetic character turning visitors away from these historic water features. Today, Belle Isle is the most heavily used park in the City of Detroit. It provides many of its four million annual visitors opportunities to participate in a variety of recreational experiences within a unique natural environment. Recognizing the value of this resource, the City of Detroit Recreation Department has committed to restoring basic water recreational activities which have historically been part of the Belle Isle experience. 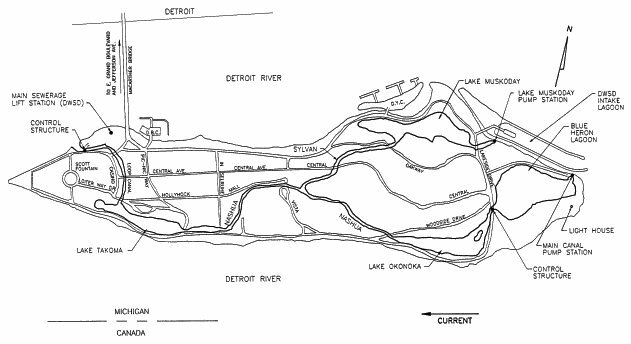 In 1992, JJR Incorporated (JJR) was retained by the City of Detroit Recreation Department to complete an extensive study, Belle Isle Canal Rehabilitation, outlining a comprehensive rehabilitation program that included habitat restoration, selective dredging, streambank stabilization, relocation of a pump station, modifications to outlet structures, creation of fish habitat, wetland creation, public involvement, and development of a sustainable management program. JJR has completed four of the five phases of the rehabilitation program. Although the project continues, the benefits of the work already completed have been realized as the lakes and canals are once again inviting island visitors to canoe, fish and explore the natural wonders of this "jewel" in the Detroit River. Investigative assessment of water quality, hydrology, aquatic resources, pumping systems and land use provided identification of factors responsible for degradation of the water feature. The lakes and canals were eutrophic and exhibited poor water quality, low dissolved oxygen, excessive plant growth, algae blooms and invasive, non-native aquatic plants. There had been a decline in the fishery resource, an increase in public health concerns, and decline in aesthetic quality. The primary causes of deterioration were lack of positive water flow through the system, excessive nutrient and bacterial inputs from point and nonpoint sources, and poor maintenance practices. This study led to the development of a comprehensive program. Recommendations included rehabilitating physical and biological variables, providing for an improvement of existing conditions. Table 1 summarizes the changes resulting from implementing the Belle Isle Habitat Restoration Project. Figure 2 illustrates the various locations where rehabilitation efforts within the water feature occurred. Table 1. Summary of past and present condition of important habitat variables resulting from Belle Isle Habitat Restoration Project implementation. Figure 2. Belle Isle Lake and Canal habitat restoration project location. Increased flow was accomplished by modifying the pumping system. The main pump station at the Blue Heron Lagoon was relocated to Lake Muskoday and the old, deteriorated pumps were replaced with new pumps capable of pumping a combined 1,369 dm3/s (2900 cubic feet per minute). Over 3.2 km (2 mi) of canals were dredged and re-graded, assisting in the creation of positive flow throughout system. These modifications have resulted in an increase in total volume turnover rate from 45 days to just five days. Improved flows have resulted in improved water quality through the continuous exchange with Detroit River water. Lakes Muskoday and Okonoka were very shallow basins (mean depth 1.2 m (4 ft)) exhibiting little habitat diversity. In each lake, approximately 0.6 ha (1.5 acres) of deep water habitat (approximately 3.7 m or 12 ft deep) were created. Approximately 2.8 ha (7 acres) of emergent wetland were created from rich, organic sediments dredged from the lake bottoms. The lakes now serve as valuable summer and winter refuge for adult fish (e.g., Northern pike, yellow perch, smallmouth bass, largemouth bass, black crappie, red-eared sunfish, bluegill sunfish, channel catfish) inhabiting the system and nursery, forage and spawning habitat for fish and wildlife. The most significant contribution to habitat in the Detroit River was the opening of the Blue Heron Lagoon to the Detroit River. Modifications to the inlet will allow fish passage into this 17.4 ha (43 acre) Lagoon providing spawning, resting and nursery habitat badly needed in the Detroit River. Eurasian watermilfoil and curleyleaf pondweed dominated the plant communities. Because these plants propagate effectively through cuttings, the long standing practice of mechanical harvesting was ceased. Selective treatment with herbicide was implemented specifically targeting these invasive and exotic plant species. The lakes and canals were dewatered during the dredging operation. Drawdown was maintained through the succeeding winter, resulting in considerable die-back of nuisance aquatic vegetation. 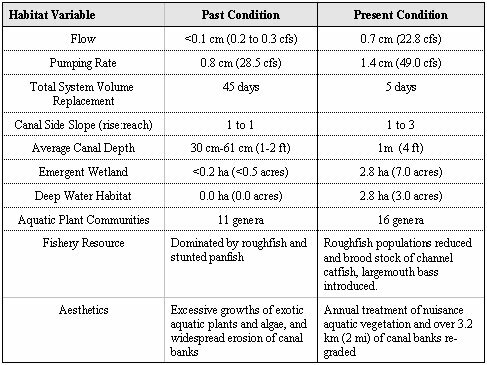 Improved flow, water quality, aquatic habitat and reduction in the roughfish populations created favorable conditions for re-establishment of a recreational fishery. Brood stock of several species warmwater gamefish (e.g., smallmouth bass, largemouth bass, black crappie, red-eared sunfish, channel catfish) were planted by fisheries biologists from the Michigan Department of Natural Resources - Division of Fisheries. The rehabilitation program is being accomplished in several phases, providing flexibility for project completion with respect to regulatory agency coordination, costs and funding, and the island's overall master plan. Presently, four phases have been completed. The costs of the program were estimated to be $1.6 million (U.S.).